Note: The Cast Application Framework Receiver SDK is compatible with both v2 and v3 senders. Provides an interface to display the app's content on the TV. Handles messages from the sender application to control content on the receiver device. Handles custom messages from the sender application that are application-specific. The CAF Receiver provides additional functionality. The CAF Receiver SDK is a major upgrade from the Receiver v2 SDK. Improvements focus on significantly reducing the amount of code required to implement a receiver app, while making Cast more reliable to maintain. This was done by implementing all common use cases into CAF. The resulting improvements in reliability and performance benefit both existing receiver apps that you upgrade as well as new receiver apps. The CAF Receiver SDK also comes with a built-in media player, which provides a seamless and easy playback experience. It also allows you to customize the player UI and provides your receiver with the ability to intercept and override messages and methods to execute your custom business logic. Use the Styled Media Receiver: This is a pre-built receiver application that provides a media player UI for audio and video content. It provides a default UI for the receiver application, but you can customize several elements in the UI with a CSS file. Develop a Custom Receiver: This is a custom built HTML5 app that you must host to handle the display of your app content on the TV. You may need to create a Custom Receiver if your app wants to display content other than audio/video media or if the Styled Media Receiver does not support the media types your app requires. If you choose not to implement a receiver, your application can use the Default Media Receiver. Note: All receivers support the media types described in Supported Media. The Styled Media Receiver is a pre-built receiver application hosted by Google that is designed for streaming audio and video content. You can style the interface with your own colors and branding assets using a CSS file. To use the Styled Media Receiver, select Styled Media Receiver when registering a new application and (optionally) provide the URL to a CSS file that defines a custom look for the receiver application's UI. For details about the CSS styles that allow you to customize the receiver application's UI, see the Styled Media Receiver guide. 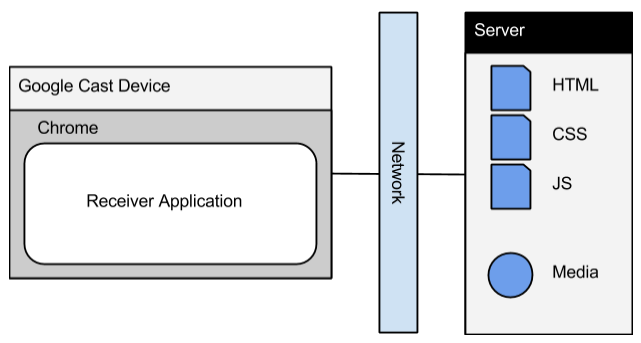 For details about how to build your receiver application with the Receiver API, see the Create a Basic CAF Receiver guide. A third option available is the Default Media Receiver. This is a pre-built receiver application hosted by Google that is designed for streaming your audio and video content. It does not require you to register with the Google Cast SDK Developer Console, but you cannot customize any of the UI in the Default Media Receiver. From your sender app, you start the Default Media Receiver app on the Cast device and then use it to load the URL to your media. Queueing is a major feature introduced as part of CAF Receiver. The earlier Receiver v2 implementation carries a basic sender-initiated queue while the new queueing implementation in CAF Receiver introduces receiver-implemented queueing. Support of Google's cloud queue implementation so an externally stored and created queue can be directly loaded into Cast devices. Mechanisms that allows pagination of items in the queue rather than loading everything at once, solving our v2 message size limit issue. Support for new messaging such as going to the next item, the previous item, fetching a window of items, as well as getting media information related to a set of queue items. Better integration with the Cast eco-system such as Google Home through new queueing data. An easy to use QueueManager API that allows insertion, removal, and update of queue items. The CAF Receiver SDK allows your receiver app to handle player events. The event handler takes a cast.framework.events.EventType parameter (or an array of these parameters) that specifies the event that should trigger the listener. CAF Receiver SDK allows your receiver app to intercept messages and execute custom code at that point of interception. Message interception can be especially useful if you want do things like customizing the load request data. The CAF Receiver SDK supports embedding ads within a given media stream; it provides two ways to incorporate ad breaks to the receiver: client-side and server-side stitching using breaks and break clips. Audio track selection in the new CAF Receiver SDK has an AudioTracksManager class that simplifies and streamlines track selection, giving you more control and better access to properties, such as name, URL and language. Closed caption track selection in the new CAF Receiver SDK has a TextTracksManager class that simplifies and streamlines track selection, giving you more control and better access to properties, such as name, URL and language (much like Audio track selection). Message exchange is the key interaction method for receiver applications. A sender can send a message to the receiver and vice versa. A receiver application may choose to listen for messages on a specified namespace. It is then up to any connected senders wishing to communicate on that namespace to use the appropriate protocol. The CAF Receiver SDK provides a built-in player UI. In order to use the built-in player UI you need to add cast-media-player element to your HTML. CSS-like styling allows setting various things including background-image, splash-image, font family and other things. This functionality allows for better branding and overall customization. Custom UI data binding allows you to use your own custom UI element and use the PlayerDataBinder class to bind the UI to the player state. The binder also supports sending events for data changes, if the app does not support data binding. CAF Receiver supports preloading of media items after the current playback item in the queue. The preload operation pre-downloads several segments of the upcoming items. Preloading will work for HLS and Smooth streaming content by default. For regular MP4 video and audio files such as MP3, those will not be preloaded, as Cast devices support one media element only and cannot be used to preload while an existing content item is still playing. With the introduction of smart displays, the CAF Receiver SDK now adds support to enable touch controls on your receiver app when launched on these devices. The CAF Receiver SDK provides a default UI experience with additional customization of the player controls. By default, the CAF Receiver handles most incoming voice commands from Assistant-enabled devices. Common media commands enable and display the same UI that is used for normal operation (touch and non-touch).